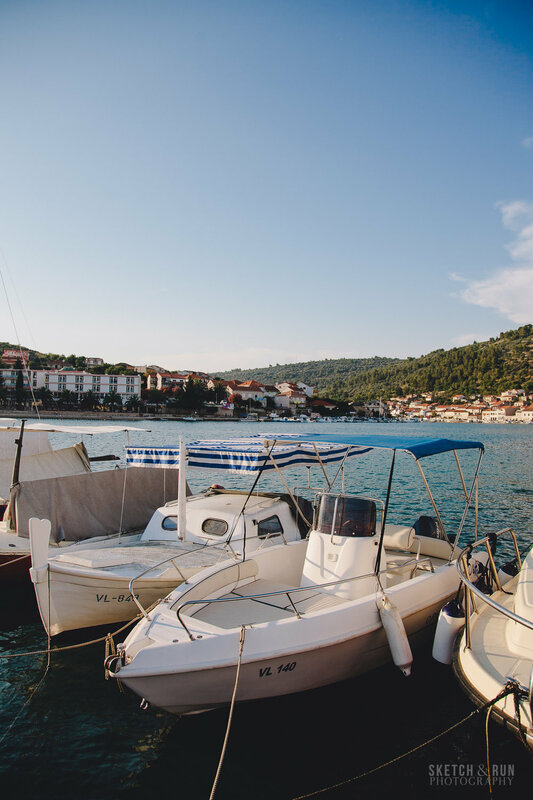 The final stop on our Europe trip was a small town called Vela Luka, off the coast of Croatia. The town boasts exactly one hotel along a strip of small restaurants, a community church and small open market stalls that sold racks of sunglasses, hats and souvenirs - which seemed to be a permanent fixture of the Croatian islands. We ended up in Vela Luka because we had to go on some World Ventures Dream Trips during this Europe trip due to certain circumstances, and so we did two 'Dream Trips' - one in Vienna and one in Croatia. I can say it went exactly as I expected and I would absolutely NOT recommend World Ventures. If you don't want to plan your own trip, just go to a travel agent. There's absolutely nothing 'exclusive' we did on both the Vienna and Croatia trips that makes it worth the time and cost of having to join this MLM system; in fact, the Vienna tour managed to be both sparse (we only had a handful of arranged activities like an unnecessarily long river tour and night bus tour where we weren't even able to get off anywhere) and thoroughly mediocre. The Croatia tour was slightly better at incorporating day trips and activities (like...a 'cooking class' were we rolled some pre-prepared dough to make kifli) but you would have gotten a lot more value for money and saved on travel time if you had just stayed in Split or Dubrovnik. We also had to get to Vela Luka on our own because World Ventures will claim that they take care of airport transfers but only for select tours and predictably, the hard, multiple-part journey to get to Vela Luka is not covered in the package. That journey was a drama in itself - the only way to get to Vela Luka (an island) is by boat, and it runs once every two hours until about 5PM. Our flight from Prague to Split was delayed, which meant we were in danger of missing our boat to Vela Luka and having to wait 2hrs for the next one. Our wonderful driver from Airport Shuttle Express floored it all the way to the port, shouting down the workers JUST as they were about to pull up the bridge leading to the catamaran. We got on, panting, sweaty and frantic, at the last second. Then, groggy and disoriented from an hour napping on the ferry, we got off on the island of Hvar instead of Vela Luka, two stops early. After dragging our gigantic suitcase over 800m of cobblestone in 35C heat, we got to the taxi stand and showed the driver our hotel location. He looked at us, nonplussed, and said, "that's on a different island." The last catamaran to Vela Luka had left by that point. Our only option was to wait an hour to get on another ferry to Korcula (the last one for the day) and taking a taxi to Vela Luka, located on the other side of the island. So...don't do that. For the most part though, our week on Vela Luka - in balmy summer heat - was an exercise in slowing down after two weeks of travelling. The concept of 'doing nothing' as a way of relaxing usually causes me more anxiety because I always want to be seeing and experiencing as much as possible when abroad and I don't like 'beach' style holidays. I can't deny, though, that there is something serene about the late afternoon golden hour flare bouncing off the boats on the harbour. It is nice to nap in the afternoon and wander about the tiny town without worrying that you're missing out on something...because you exhaust pretty much everything there is to do in the town after about a day. When the place is so simple, it's much easier to just soak in the moment. I wouldn't choose it again, but if you've just had exhausting weeks of high-energy activity, don't underestimate the value of a few days of slowing down the pace. Just don't spend most of your week sending out job applications with a deadline because the Wifi at the hotel and on the island is truly, heinously slow and will remove any serenity you managed to acquire.